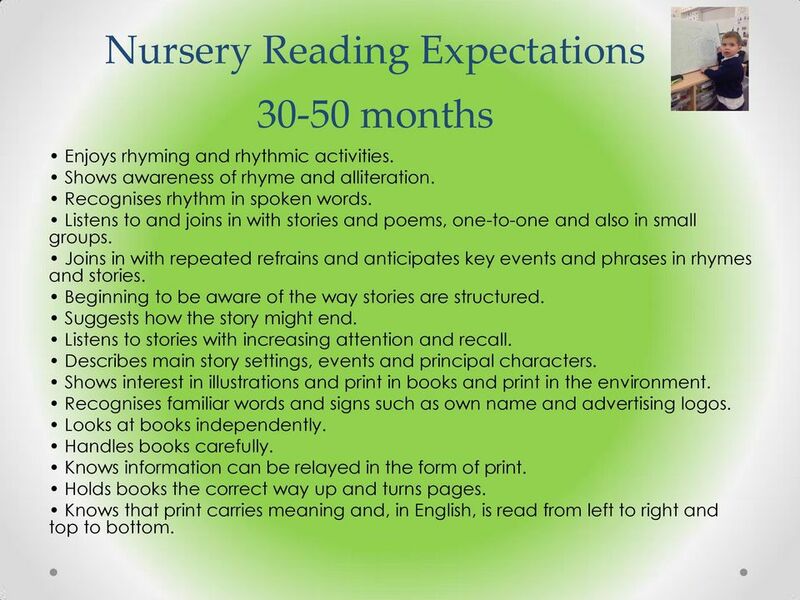 Download "Reading and Writing in the EYFS"
3 Nursery Reading Expectations months Enjoys rhyming and rhythmic activities. Shows awareness of rhyme and alliteration. Recognises rhythm in spoken words. Listens to and joins in with stories and poems, one-to-one and also in small groups. Joins in with repeated refrains and anticipates key events and phrases in rhymes and stories. Beginning to be aware of the way stories are structured. Suggests how the story might end. Listens to stories with increasing attention and recall. Describes main story settings, events and principal characters. Shows interest in illustrations and print in books and print in the environment. Recognises familiar words and signs such as own name and advertising logos. Looks at books independently. Handles books carefully. Knows information can be relayed in the form of print. Holds books the correct way up and turns pages. Knows that print carries meaning and, in English, is read from left to right and top to bottom. 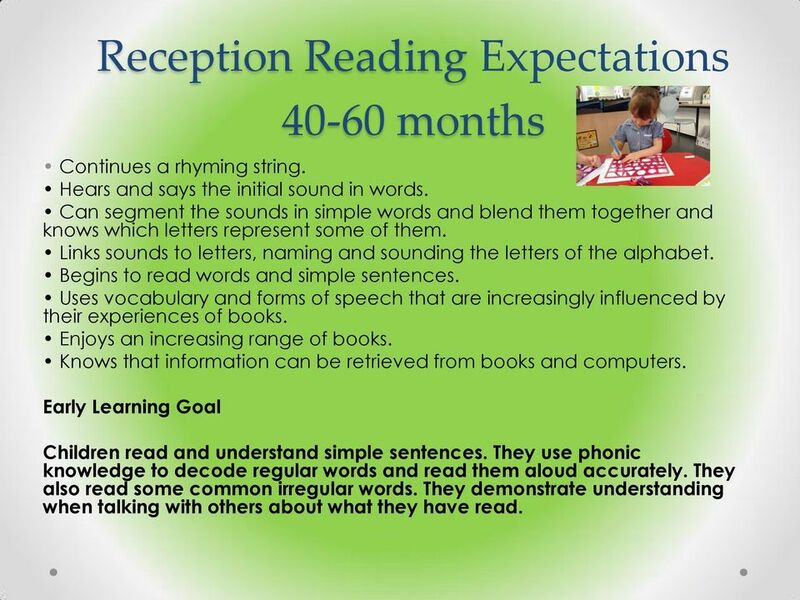 4 Reception Reading Expectations months Continues a rhyming string. Hears and says the initial sound in words. 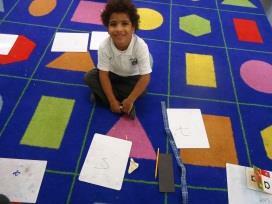 Can segment the sounds in simple words and blend them together and knows which letters represent some of them. Links sounds to letters, naming and sounding the letters of the alphabet. Begins to read words and simple sentences. Uses vocabulary and forms of speech that are increasingly influenced by their experiences of books. Enjoys an increasing range of books. Knows that information can be retrieved from books and computers. 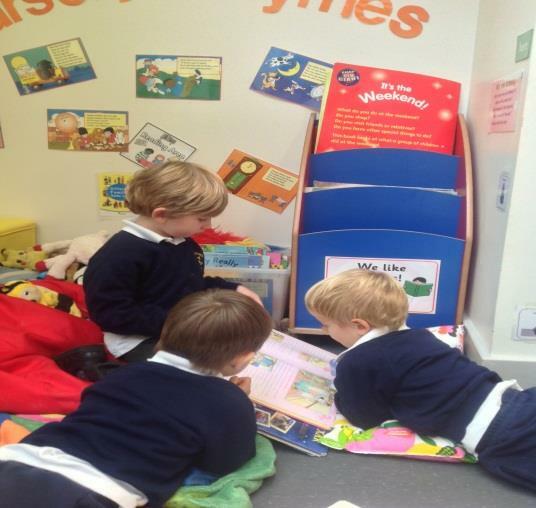 Early Learning Goal Children read and understand simple sentences. They use phonic knowledge to decode regular words and read them aloud accurately. They also read some common irregular words. 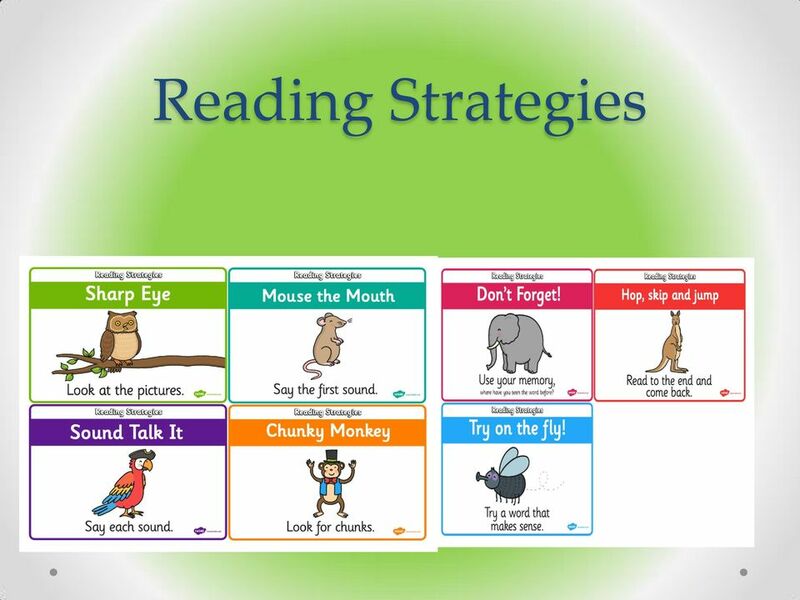 They demonstrate understanding when talking with others about what they have read. 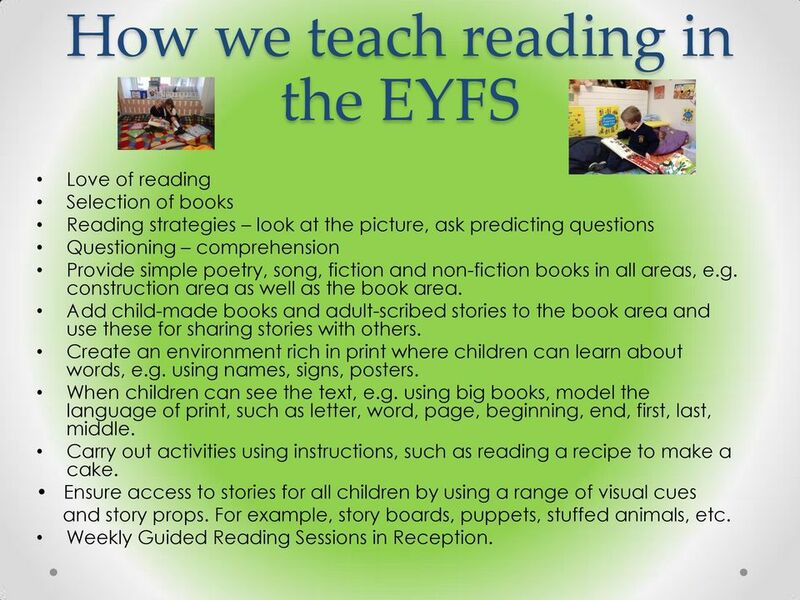 5 How we teach reading in the EYFS Love of reading Selection of books Reading strategies look at the picture, ask predicting questions Questioning comprehension Provide simple poetry, song, fiction and non-fiction books in all areas, e.g. construction area as well as the book area. Add child-made books and adult-scribed stories to the book area and use these for sharing stories with others. 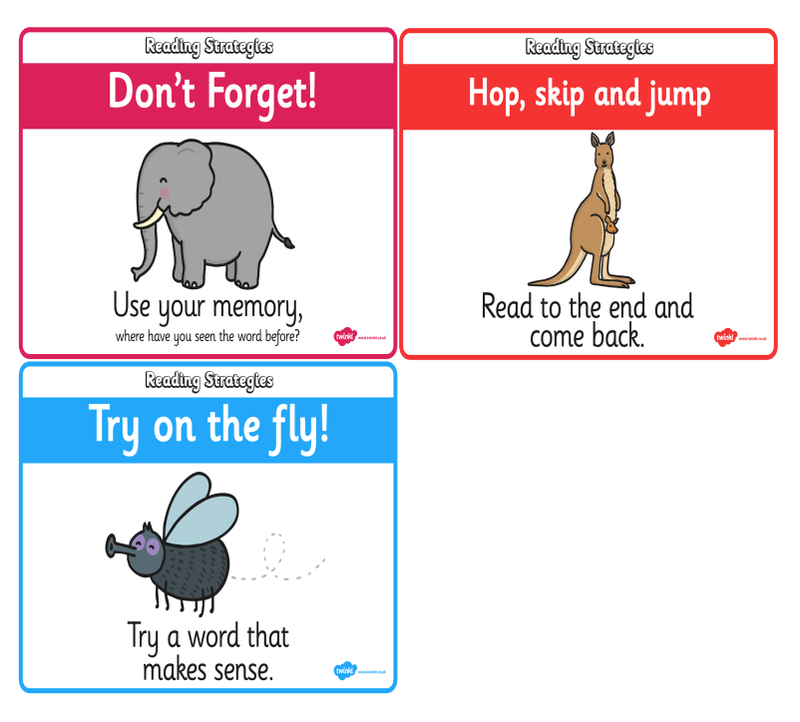 Create an environment rich in print where children can learn about words, e.g. using names, signs, posters. When children can see the text, e.g. using big books, model the language of print, such as letter, word, page, beginning, end, first, last, middle. Carry out activities using instructions, such as reading a recipe to make a cake. 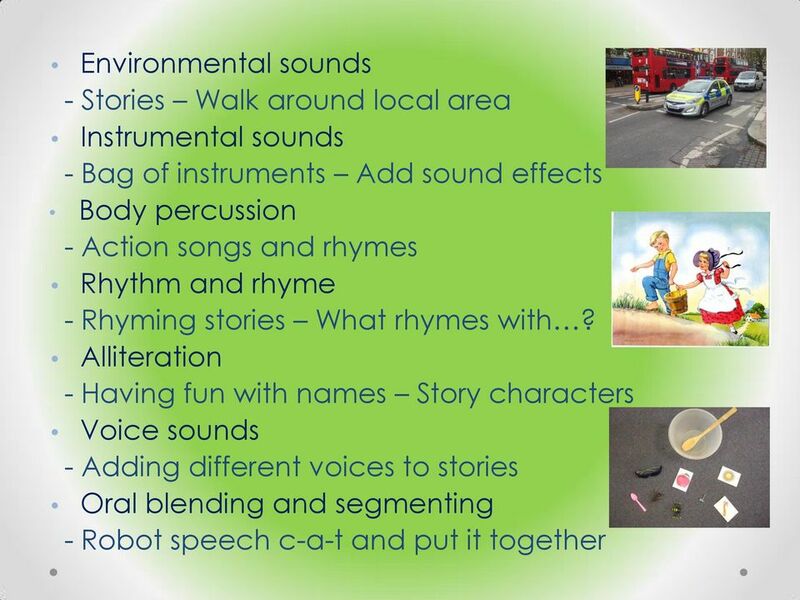 Ensure access to stories for all children by using a range of visual cues and story props. For example, story boards, puppets, stuffed animals, etc. 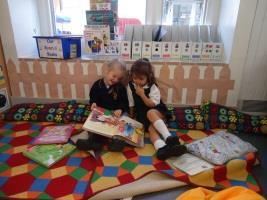 Weekly Guided Reading Sessions in Reception. 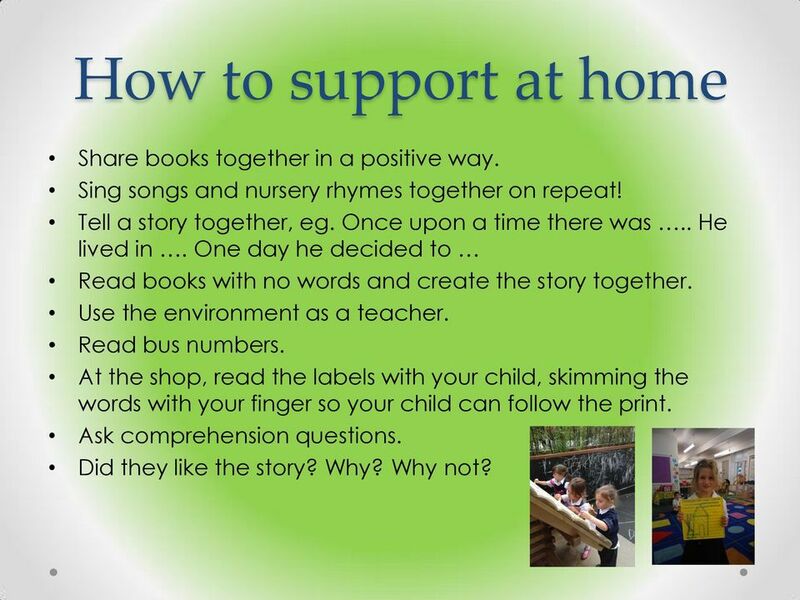 6 How to support at home Share books together in a positive way. Sing songs and nursery rhymes together on repeat! Tell a story together, eg. Once upon a time there was.. He lived in. One day he decided to Read books with no words and create the story together. Use the environment as a teacher. Read bus numbers. At the shop, read the labels with your child, skimming the words with your finger so your child can follow the print. 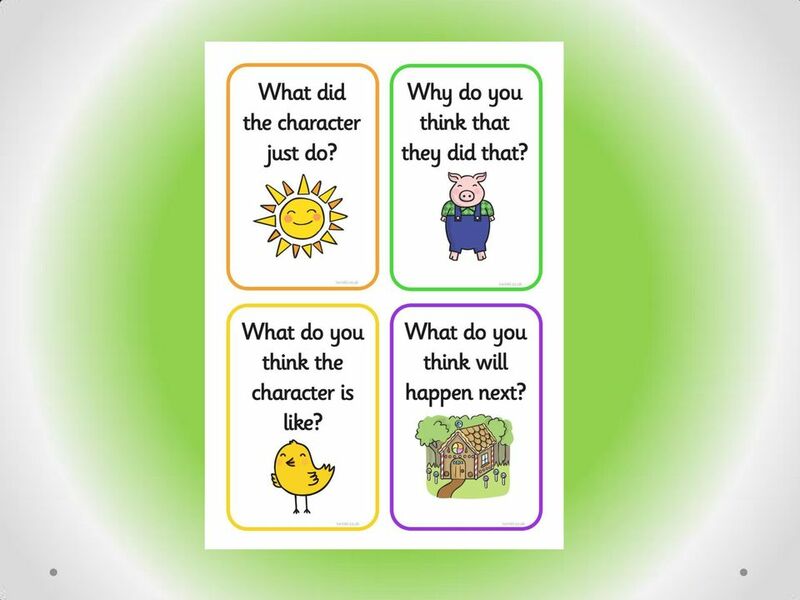 Ask comprehension questions. Did they like the story? Why? Why not? 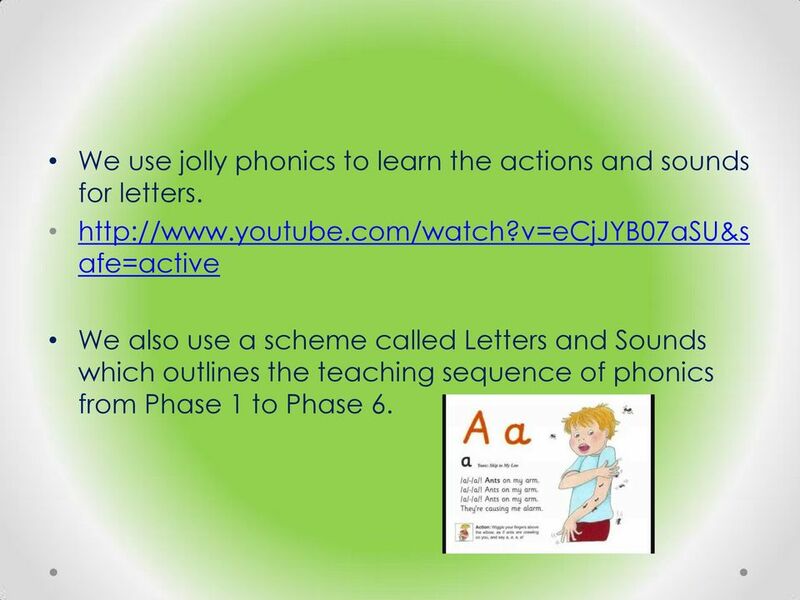 10 We use jolly phonics to learn the actions and sounds for letters. 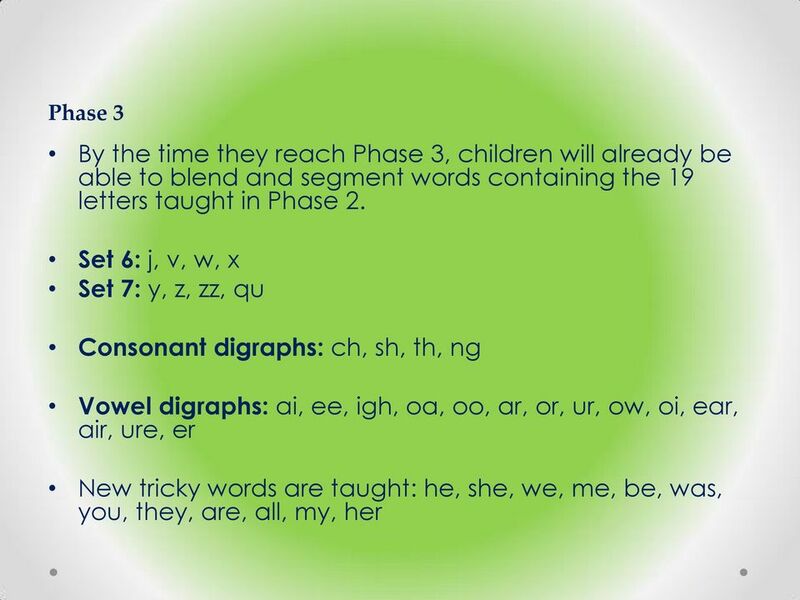 afe=active We also use a scheme called Letters and Sounds which outlines the teaching sequence of phonics from Phase 1 to Phase 6. 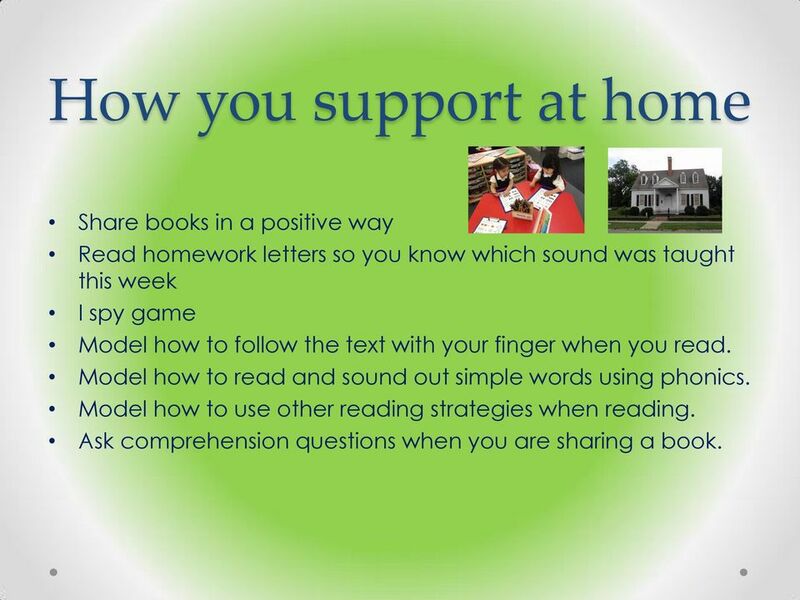 13 How you support at home Share books in a positive way Read homework letters so you know which sound was taught this week I spy game Model how to follow the text with your finger when you read. Model how to read and sound out simple words using phonics. 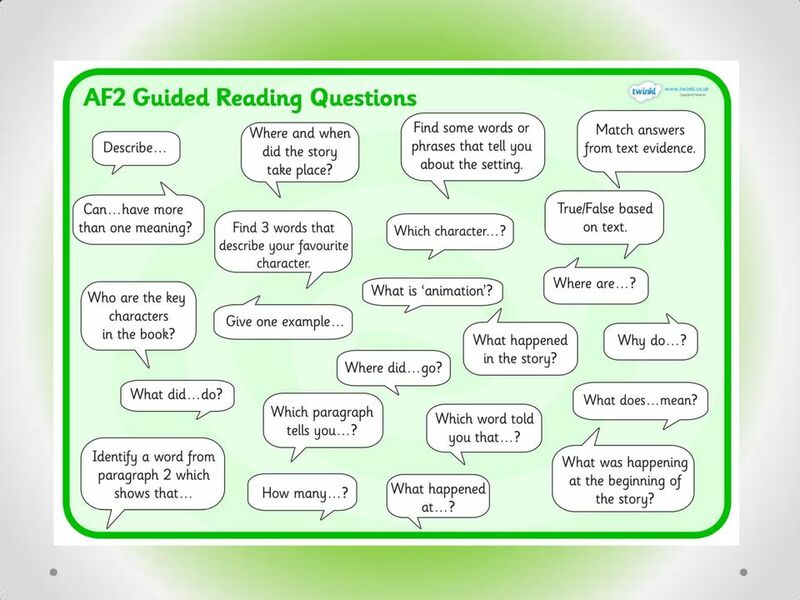 Model how to use other reading strategies when reading. 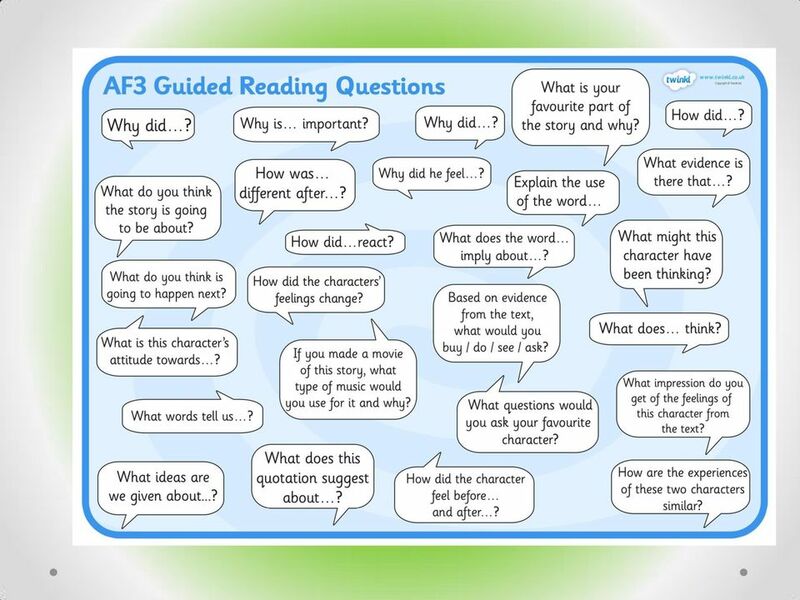 Ask comprehension questions when you are sharing a book. 17 Become the Teacher! 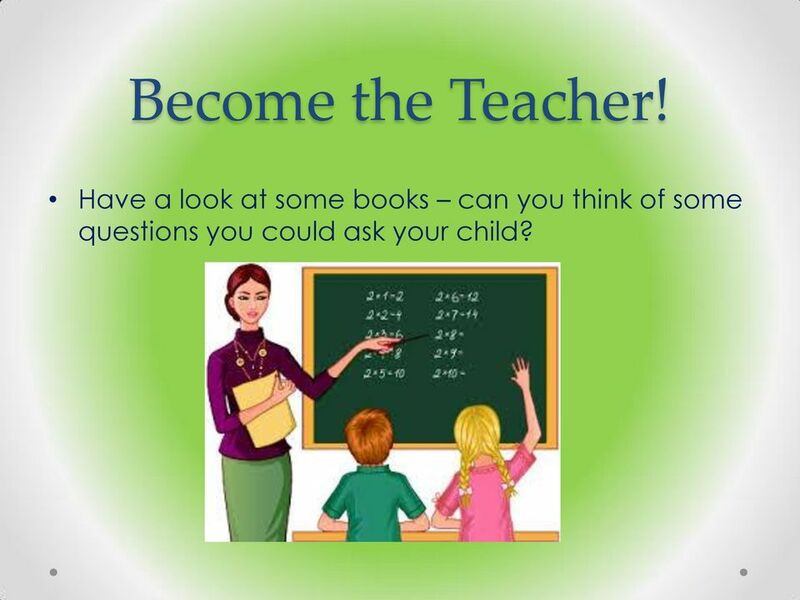 Have a look at some books can you think of some questions you could ask your child? 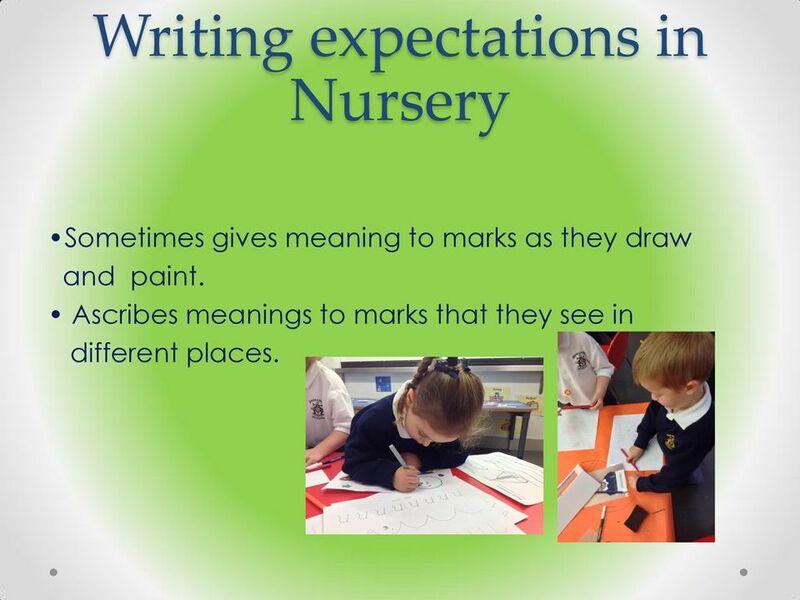 18 Writing expectations in Nursery Sometimes gives meaning to marks as they draw and paint. Ascribes meanings to marks that they see in different places. 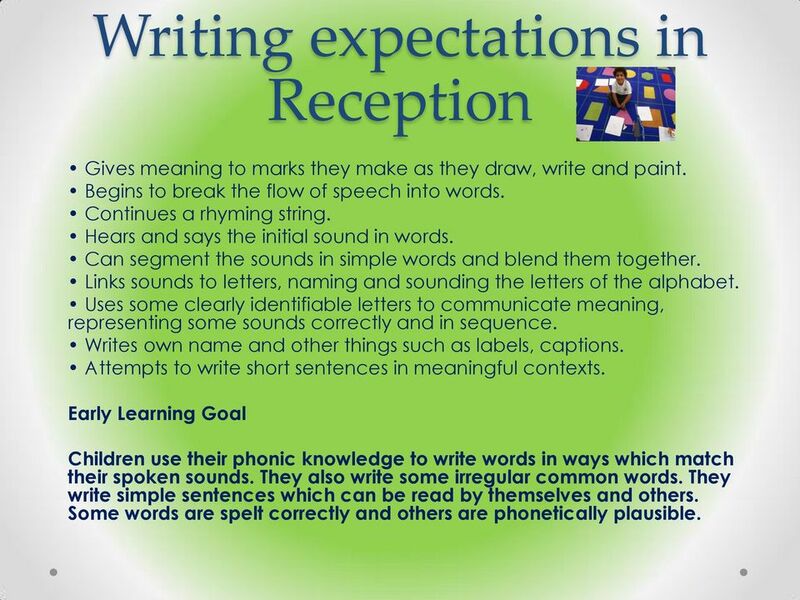 19 Writing expectations in Reception Gives meaning to marks they make as they draw, write and paint. Begins to break the flow of speech into words. Continues a rhyming string. 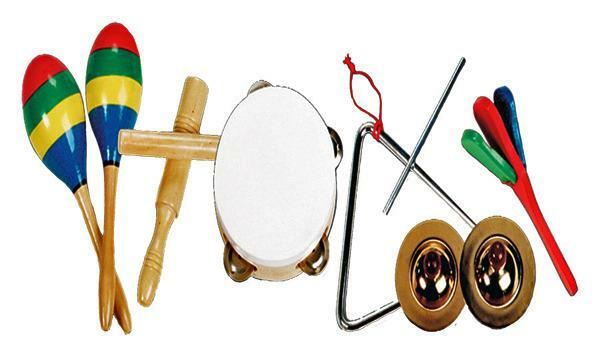 Hears and says the initial sound in words. Can segment the sounds in simple words and blend them together. Links sounds to letters, naming and sounding the letters of the alphabet. Uses some clearly identifiable letters to communicate meaning, representing some sounds correctly and in sequence. Writes own name and other things such as labels, captions. Attempts to write short sentences in meaningful contexts. 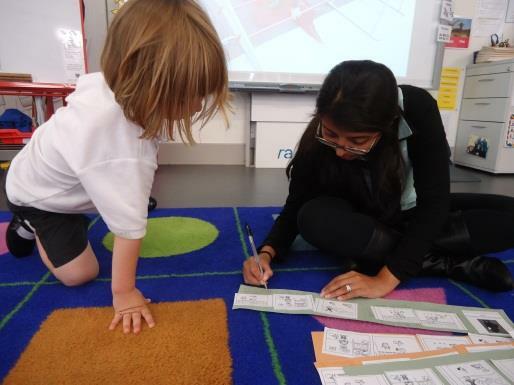 Early Learning Goal Children use their phonic knowledge to write words in ways which match their spoken sounds. They also write some irregular common words. They write simple sentences which can be read by themselves and others. Some words are spelt correctly and others are phonetically plausible. 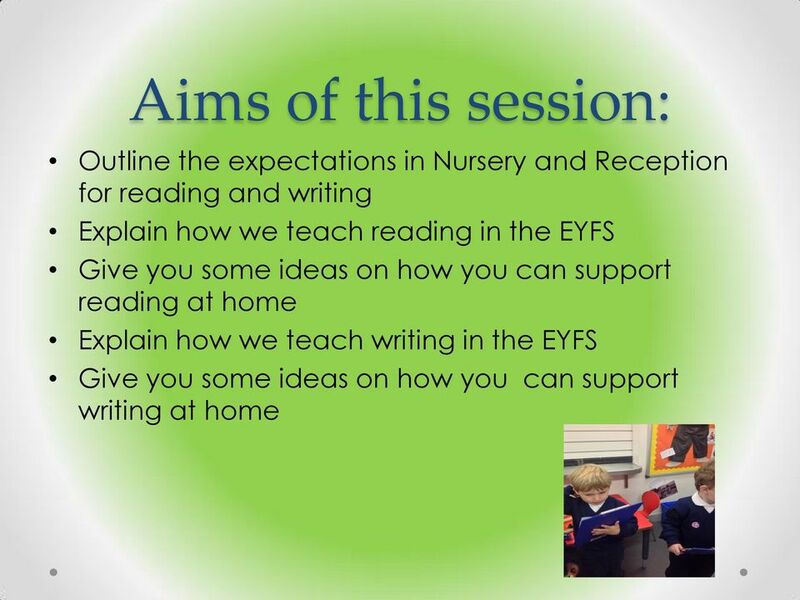 21 What can you do at home to support writing? 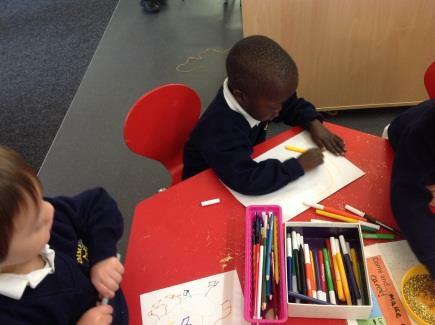 Encourage child to use correct pencil grip (tri-pod grip) Notice and encourage the marks children make and the meanings that they give to them, such as when a child covers a whole piece of paper and says, I m writing. Support children in recognising and writing their own names. 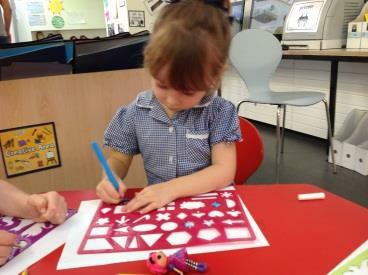 Make books with children of activities they have been doing, using photographs of them as illustrations. 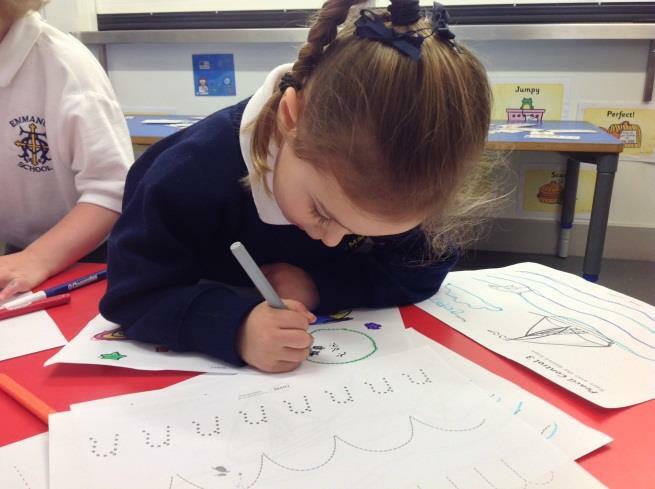 Encourage children to use their phonics when writing. Talk to children about the letters that represent the sounds they hear at the beginning of their own names and other familiar words. Demonstrate how to segment the sounds(phonemes) in simple words and how the sounds are represented by letters (graphemes). 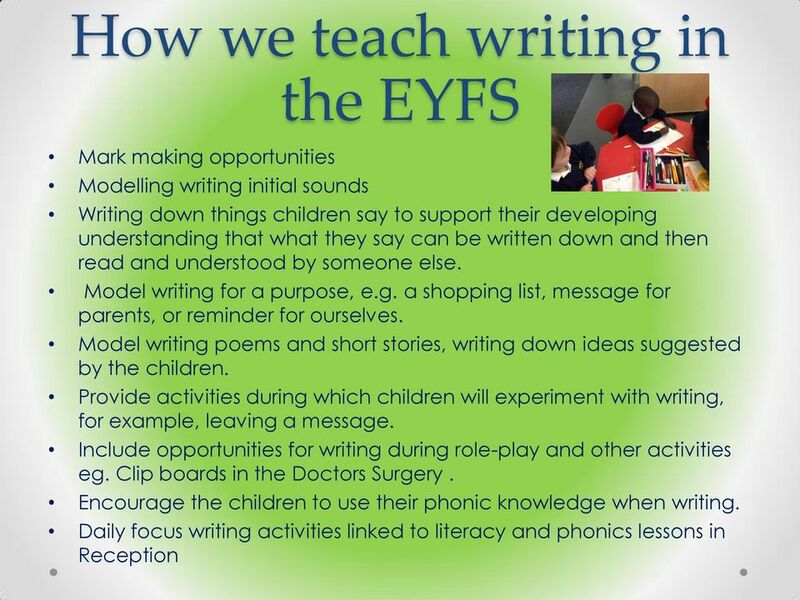 Support and scaffold individual children s writing as opportunities arise. Build up their confidence! 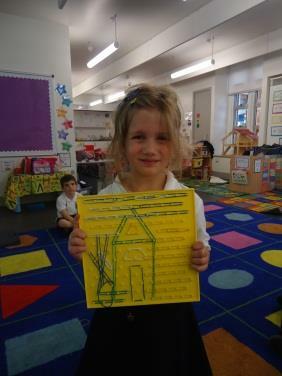 Have fun paper and pens to write with at home linked to your child s interest. 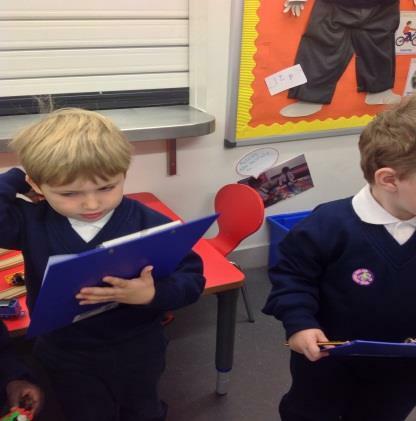 22 Have a look at some examples of writing in Nursery and Reception. 23 Any questions? Thank you! Bessemer Grange Early Years Phonics Workshop for Parents. Main Menu. Phonics (letters and sounds) Whole word reading. Individual Reading. Story sacks. Reading Schemes and monitoring. Learn the terminology. 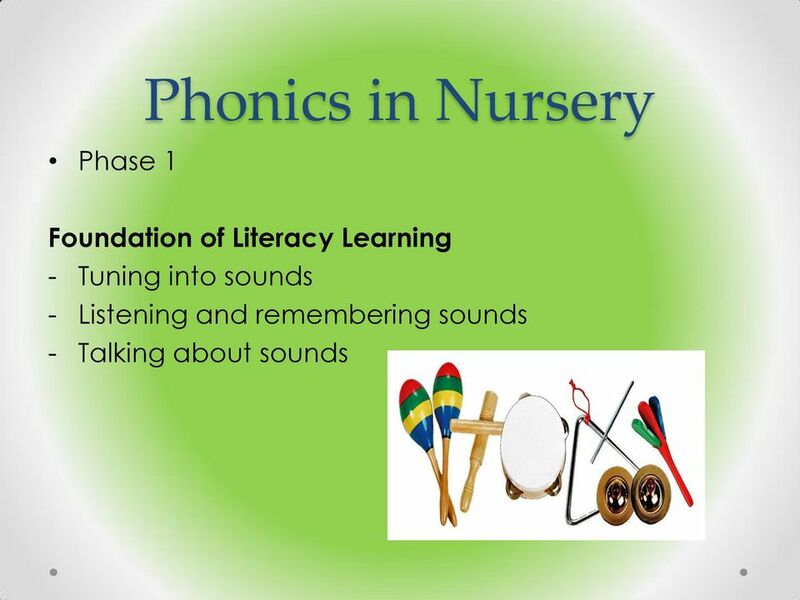 Phonics is based on the link between sounds (speech sounds that we can hear) graphemes (written sounds). Aims of the session. 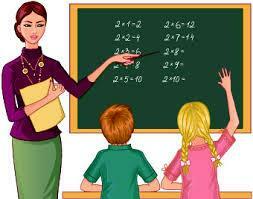 - To understand how we teach phonics at school. 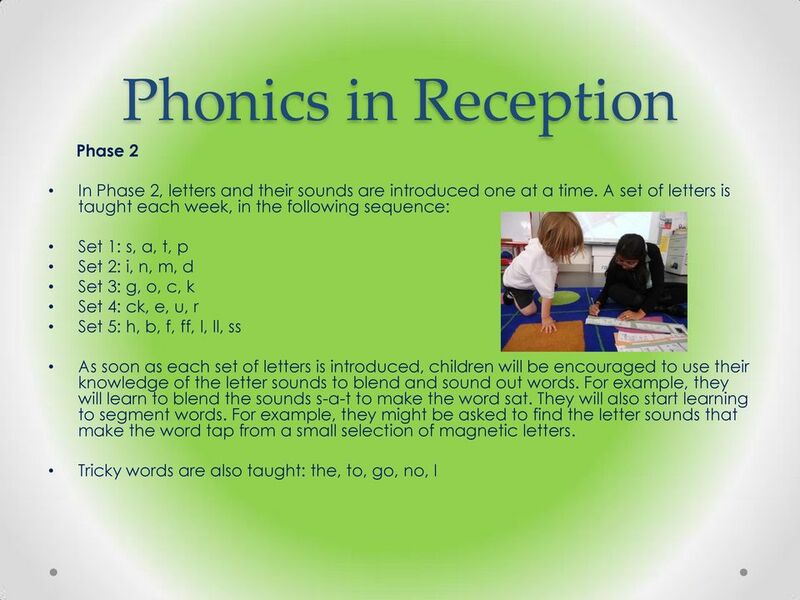 - To share information about the Year 1 Phonics Screening Test. 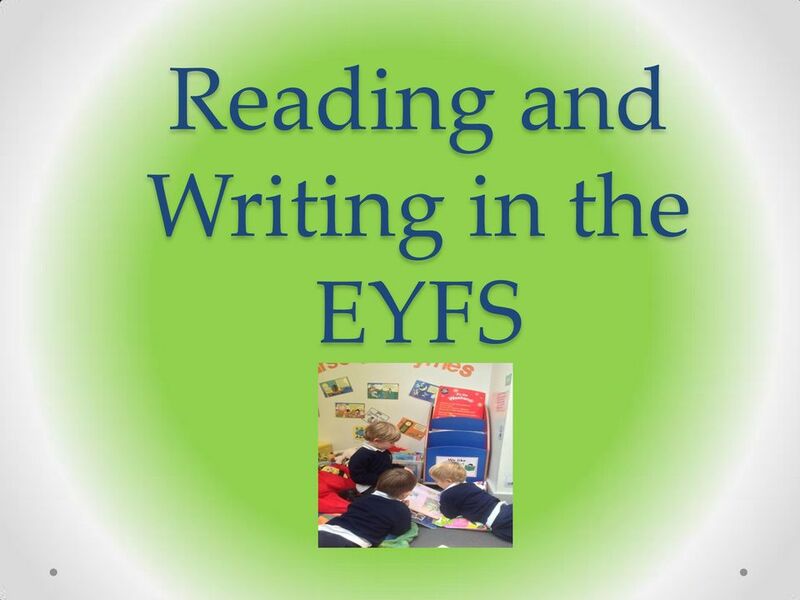 Literacy Matters at West Hove Infant School Reading and Phonics Learning at home and at school -The Reception Year- Aims of today: To explain the school s approach to the teaching of reading and phonics.